Move over, FishVille: One enterprising indie developer wants to bring casual FPS action to the massive Facebook games platform. What's the first title that comes to mind when you think about Facebook games? Mafia Wars, perhaps? FishVille or FarmVille? Whatever the game, it's likely played via a simple point-and-click interface, with no fancy-graphics or l33t gaming skillz required. At least one company wants to change that, though - indie developer 3G Studios has announced Brave Arms, "the first 'social shooter' for you and your friends to play and stay connected on Facebook." 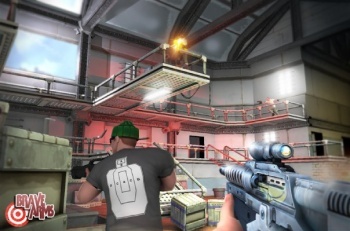 Players will be able to create their own in-game avatars and then compete against their friends, in what looks like a genuine browser-based 3D FPS. "Our new title, Brave Arms, will bring First-Person Shooter games to the masses," says James Kosta, boss of the Reno, Nevada-based 3G, "It's about fast-paced action and either competing against or forming teams with your friends. We want people to feel empowered and to share in a real video game experience." 3G Studios has previously developed games like Jillian Michaels' Fitness Ultimatum 2009 for the Wii (probably not very relevant to the development of this game), SWAT: Target Liberty on the PSP (probably more relevant than Fitness Ultimatum), as well as iPhone games Zombeat and The Deep. It's an interesting idea, melding "traditional" gaming with the massive casual gaming platform that is Facebook. Only time will tell if it'll pay off.